I love the colorful Japanese Kokeshi dolls that are widely collected. They are handmade from wood, have a simple body and an enlarged head with a few thin, painted lines to define the face. One characteristic of Kokeshi dolls is their lack of arms or legs. 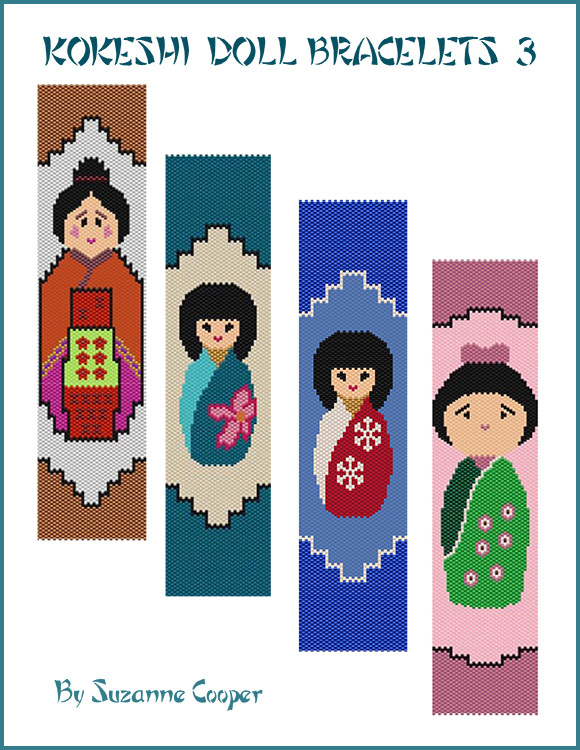 These Kokeshi doll patterns can be made as bracelets or you can bead just the doll section and use the piece as a necklace element. This e-book contains the following 4 patterns which are also available individually. There are no instructions, no color keys (Delica bead numbers or quantities), just pretty patterns for those of you who love to bead and want patterns at a very affordable price.